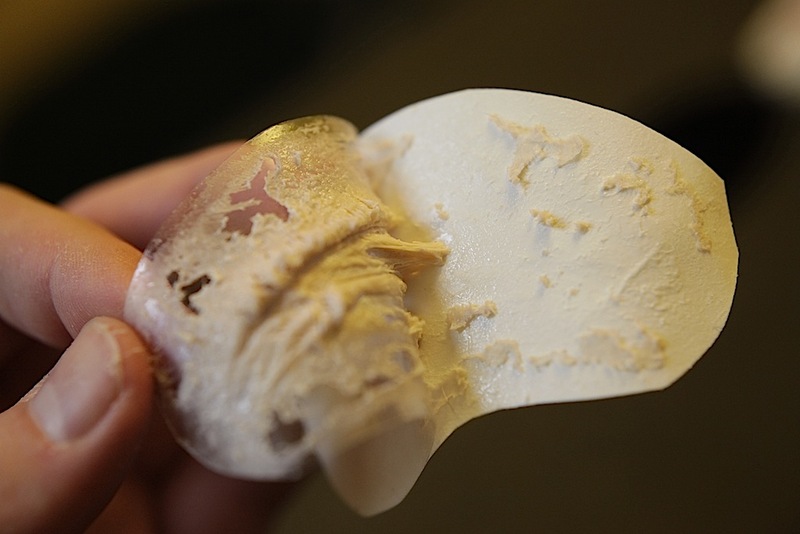 Is there a specific release agent to coat acetate used during a 3d transfer procedure? I don't use a "dedicated" acetate sheet, so i need to use something to allow the bondo appliance to stick-out from the acetate when the transfer paper is attached to the piece. I tried with some release agents like Vaseline, silicone based spray etc but the main piece does not leave the acetate. Hey Mauro, We sent your question along to Oscar-winning Creature FX master Howard Berger and he had this to say, "If you do not have the proper acetate for transfer, you can go to a hardward store and ask for PVA. This is a water base separator we use for fiberglass molds. Give the acetate 2 light airbrushed coats, use a hair dryer between each layer, let completely dry and this should help you out. Good luck!" Thank you very much. I am very Grateful to you all for all precious informations shared on this site, online lessons and DVDs. This exchange of information just made my day! Love this forum. Will be beginning the 3d pros aide process soon ordering my materials to get going. Got some PVA and making some test.... will let you know. Starting my first run of 3D Transfers… wish me luck..!! from the first test with PVA, i noticed that if i wait more than 12 hours before peeling off acetate, the application does not leave the acetate. Instead, if i complete all the procedure in about one hour, everything is fine. So it seems that actually i can't prepare pieces to apply in the future. I'm sure that i make mistake somewhere. Anyway I'm going on with tests. A note: having some big differences in acetate behavior (in terms os releasing property) when i use PVA with brushes or airbrush. Awesome. I was in the same situation, but I tried Mann's Ease Release 200 (General Purpose Mold Release) lightly coated on the acetate but the pros-aide piece managed to weld itself to the acetate. I'll find some PVA and airbrush it to the Acetate and report back. Has anyone else had their pros-aide piece develop hairline cracks as if it were drying out too much? during my experiments, i tried also inkjet printing acetate and i have been surprised to notice that it simply works. The sharpie does not bleed but the acetate sticks out from the transfer paper and transfer piece nicely. Anyway I'm sure that PVA is the final solution if not using dedicated self-releasing acetate. i have some shrinkage too and after some time the piece tends to crack too. i guess it's normal but i also think that most depends on the bondo's density, i mean, less thick should crack less... just try out and let me know if you like. I don't know if you're doing this or not, but using canned air to flash freeze the appliance can help get it off by stiffening the bondo. You're right, I made some new PTM and used less cabosil. No cracks and much more sticky out of the mold. I'm also trying your Inkjet transparency idea, having had a box lying around. I have decla paper, too but I feel like the film that comes off as well degrades the piece. I suppose once adhered you can wash that off. My tests coating acetate with PVA has been mixed. Pulling the piece from the freezer causes some condensation which makes the PVA gummy immediately and a mess to pull from the mold. Also, PVA coated photo paper (used for the glossy finish) didn't release the piece either. Unless I can find a better paper, I'm going back to the decal sheet and practicing until perfect. Fun fact... it was 18F below last week and I could just set my molds out on the porch and they polymerized faster than my freezer! So here are my results: PVA is a bust - either gums up the prosthetic or doesn't release from the acetate. Went back to Mann's 200. Decal paper - transfers a huge glossy, plastic sheet covering the prosthetic. I've dampened a piece and pulled the glossy surface and left enough 'water soluble release' to let the piece slide. Will update if any of this actually works. it seems we are having all the same situations and problems. From a point of view I'm "happy" because it does mean that I'm not alone !! I also tried a special parchment paper that is double sided-siliconed coated but as you mentioned, wrinkles are boring and don't let a flat, even surface to be created. I'm pretty sure that PVA works if coated with airbrush instead of a normal brush but you must use the appliance in short time because after 24 hours acetate wont release bondo easily. Using a tattoo acetate allows to use the appliance in time (if we don't mind the natural shrinkage of the appliance itself). My goal is to use food acetate, coat with something and then use decal transfer paper with it. In my case, that would the cheapest recipe to prepare amount of transfer appliances to use in my needs. I noticed that on the transfer acetate and paper i tried out, there is a thin layer of some kind of adhesive that releases itself if used with temporary tattoo. This thing encapsulates the printed tattoo. Using this kind of transfer kit, encapsulate the bondo appliance too. If I remove this thin layer from the acetate, it allows a good releasing property as well... so i guess that there must be a product to coat acetate. No Maurio, you're not alone! I'd set the process aside for a while, but in another project I found that I have transfer paper used for vinyl cut decals, and that leaves a thick, waxy release paper as waste product. It's opaque, but I think it will release the transfer material. I plan to test this tonight. Back to the decal paper, I've tested pulling an entire sheet of the glossy print medium off, leaving a full 8.5x11 sheet of paper that transfers a prosthetic very very well. It's going to be my go-to material. I recommend it to anyone trying this process. One last experiment Maurio: try using plain acetate with a thin coating of petroleum jelly as the release. It's the best solution so far and can be cleaned off with soap and water once applied to the model. I'll keep experimenting. I feel like the only acetate solution will be a purpose, coated silicone release sheet made just for this. my fav is simple vaseline gel, just a little amount, rubbed with a finger in a very thin layer all over the mould and then cleaned a little with a piece of soft fabric. today I've got some silicon paper from Vittorio Sodano's shop. It seems that the release agent is so slippery that the appliance does remain on the mould !!?? So I think to coat the main mould with any release agent too just before casting bondo into it. I'am testing a silicone-based spray, normally used to make object waterproof (camp-tents, fabrics ecc.). I am using 2 or 3 coats of it on standard acetate sheets, letting dry between each pass. Still far away to have found a final solution. Awesome, I'm curious to see how that works.